As the sun sets over the Indian Ocean and pastel skies fade to black, the humid tropical air comes to life with a swarm of bats and the sound of insects. 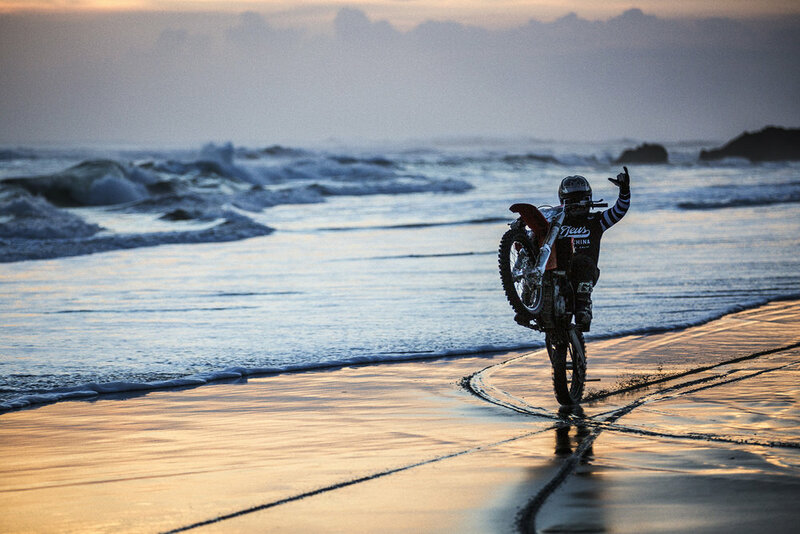 A salty ocean breeze billows up the Indonesian coastline onto the pristine motocross track that we just spent the evening riding. Sitting here on this peaceful beach in Southeast Asia, I am stuck in a daze trying to comprehend the heavenly beauty that surrounds us. Bali is an esoteric land, riddled with ancient spirits and a haunting sense of magic you can feel coursing through your veins. It’s a celestial region of the world where man, machine, and surfboard exist as one, amongst the gods, and flow together in perfect harmony with Mother Nature. Dustin Humphrey—world-class photographer, filmmaker, and the driving force behind the Deus Temple—welcomed us with open arms. He graciously hosted us in a charming villa nestled in the heart of Canggu, a small village located at the southern tip of Bali and composed of an eclectic mix of surfers, expats, and Balinese locals. The humid air in Canggu is rich with the smell of incense and a smoky haze that lingers from the various religious burnings. With an estimated 20,000 temples and shrines located on this small island, Bali is sometimes referred to as “Land of the Gods.” It’s been said that when you fall asleep here, you’ll often experience strange and vivid dreams due to an uncanny spiritual presence. While lying in bed that first night amongst the barking dogs and chickens, I listened to the looming sound of prayer as it radiated from the neighboring temples, echoing through our alleyway and dissipating into the darkness. Anticipation built for what crazy images my imagination might conjure up once I fell asleep, but I soon discovered that the most profound dreams would take place in real life over the next 10 days. The first 48 hours of this dream were a bit of a culture shock. The human connection to two wheels is vastly different here in Bali, and our first glimpse into Indonesian life gave me a completely different perspective on what the motorcycle can mean to different cultures across the world. As I witnessed daily life unfold, I saw bikes packed heavily with massive loads of miscellaneous objects ranging from crates full of chickens to large bags, bundles of leaves and brush, giant blocks of ice, and boxes stacked high and strapped to the fenders. There were full families of four or five riding on a single scooter, sometimes even carrying the family dog. I would even see parents driving to school in the morning as the kids lay dead asleep on the handlebars. It was apparent that motorcycles are by far the most efficient means of transportation and quite possibly the most important tool for everyday life in Indonesia—a far cry from what the motorcycle represents to our culture in America. Back at our villa in Canggu, we were lucky enough to stay with newfound friends and Deus Ex Machina ambassadors Zye Norris and Forrest Minchinton. Norris is a talented and well-rounded surfer from Queensland, Australia, and Minchinton is a surfboard shaper and motocross rider from Huntington Beach, California. “The boys,” as they refer to themselves, are regulars at the Temple, spending several months out of the year in Bali utilizing it as a home base to do what they do best: Surf and ride. From the moment I met and felt the positive energy radiating off these two, I knew we would soon become great friends. Each morning, the boys would wake up before the sun, strap a collection of boards onto the surf racks mounted on their bikes, and journey out to the coastline for a sunrise session. 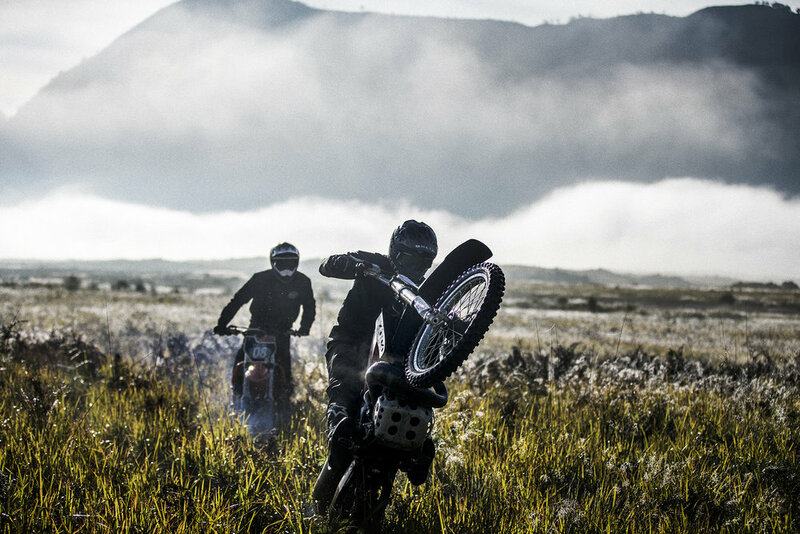 Joining Minchinton and Norris on this morning ritual would help open my eyes to the fact that motorcycles are not only a vital tool for the local Balinese people, but equally useful for the surfers. 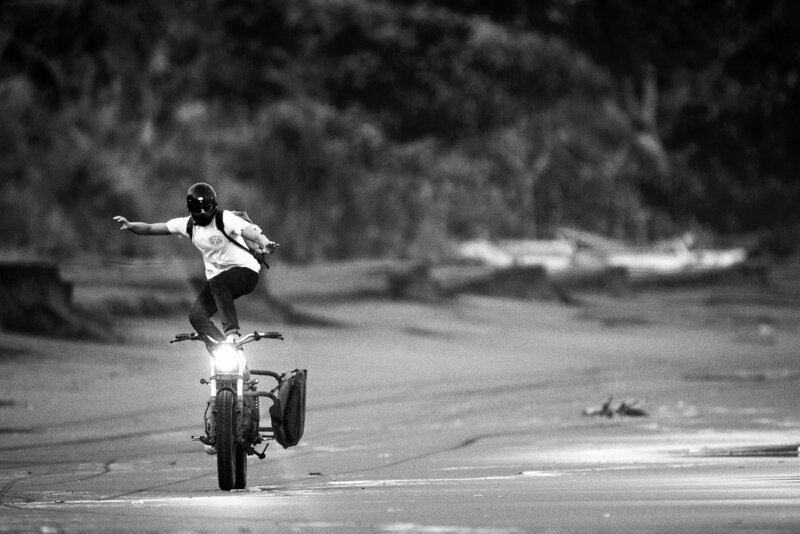 It’s how they get to the surf spots, and when they’re not surfing, riding motorcycles is what they enjoy doing for fun. Surf and moto just kind of exist as one here; there is no disconnect. 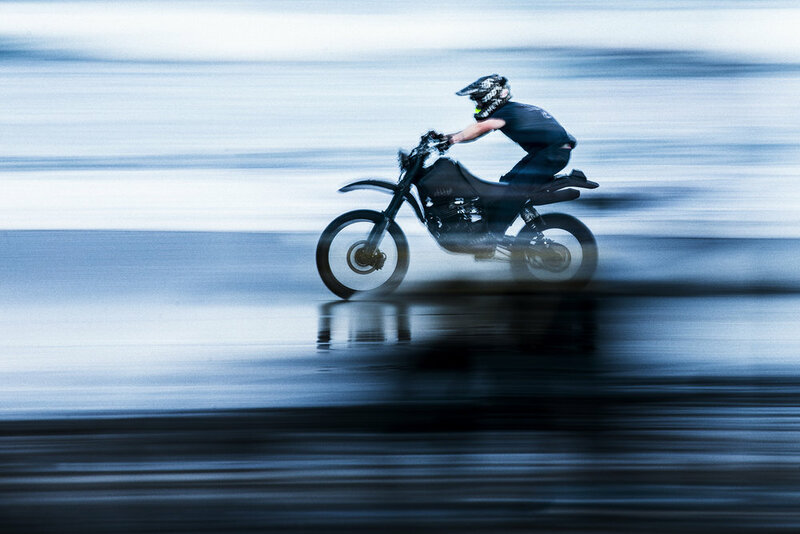 It’s like a flashback to a time during the late ’60s and ’70s in Southern California, when most surfers rode motorbikes and the moto guys were also surfers. It seems as if the boys are reliving that era, their lives like a snapshot from the iconic Bruce Brown surf and moto films of the time, The Endless Summer and On Any Sunday. Our first few days in Canggu had come to a close, and although I had enjoyed the dreamy evenings spent ripping wheelies down the beach, there was a calling for something greater—an itch to expand outward in search of a solitude that could be found only in landscapes more remote and majestic. After tossing around some ideas with the Deus crew, we decided to head north toward the Ring of Fire to get lost in time on an ancient sprawl like nothing we’d seen before. Legend has it there is a hidden paradise, born from a violent volcanic eruption almost 29,000 years ago, beckoning to be ridden. A three-hour trek across the island found us cresting a massive caldera overlooking the sacred volcano, Mount Batur, resting peacefully below. Toward the base of the volcano, nestled between a vibrant lake and a field of lava rock, we could see the tiny village where we would stay the night. 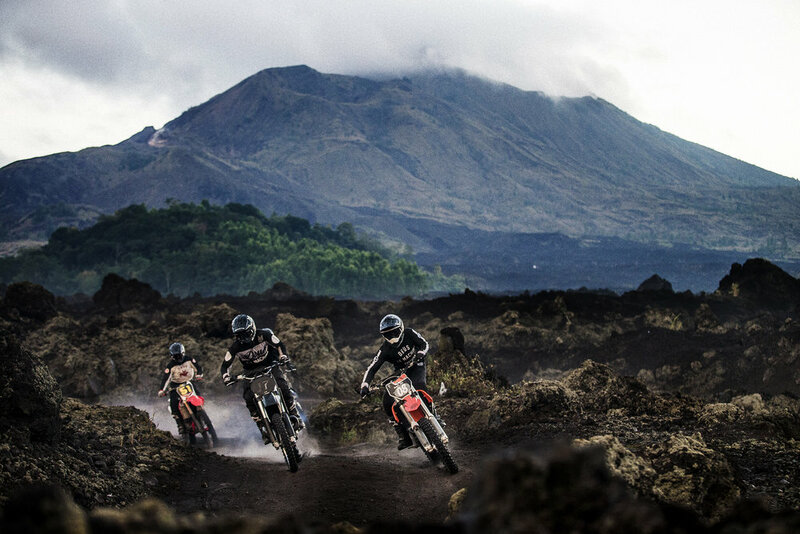 A soft formation of clouds lingered toward the top of the volcano just above the vast expanse of black volcanic sand that would act as our ultimate moto playground for the next 24 hours. We had found what we were looking for. That following morning, we woke up at 4 a.m. like bright-eyed children on Christmas morning, dying with anticipation to explore this magical place. We geared up and ventured out under the stars riding up a rugged trail, bouncing off rocks and branches, guided by nothing but a faint light cast by the moon. Darkness gave way to sunrise as the sky burned red, igniting a fiery luminance that would slowly begin to reveal the field of jagged lava rock we were riding through. Such a foreign terrain, it almost felt as if we had traveled back in time millions of years to a period when dinosaurs roamed the Earth. As the fog lifted and we approached Mount Batur, the landscape quickly transformed from large formations of lava rock into steep, rolling hills of gritty volcanic sand. It was like a gigantic skate park built for our motorcycles, perfectly crafted over thousands of years for our enjoyment. We spent the day wandering back and forth across the mountainside and it didn’t seem to matter whether we were hitting jumps, berms, hill climbs, or riding high atop the ridgelines; the fun factor was at an all-time high and this unique landscape provided limitless potential for creativity and expression. As the midday sun baked down on us, I found some shade and took a quick break to drink some water and watch Minchinton ride. His style is so smooth and effortless, I couldn’t help but notice how strikingly reminiscent it was to watching Norris surf. 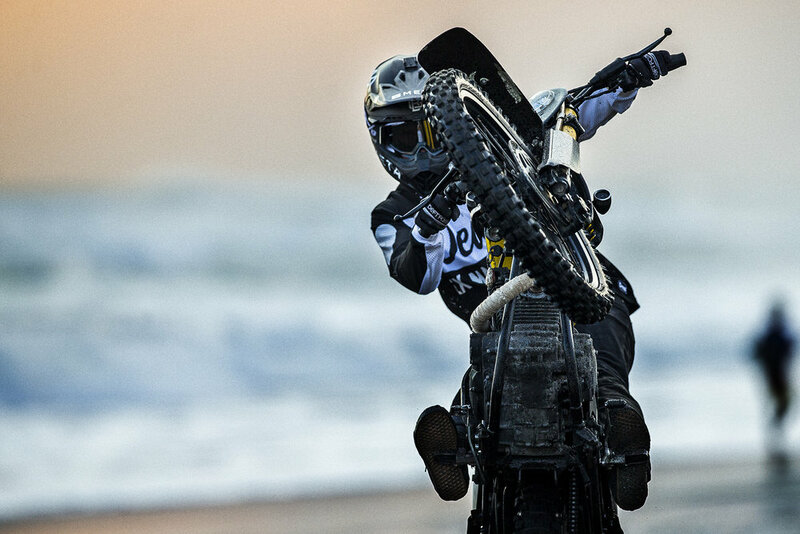 Poetically flowing, like a choreographed dance carving perfect lines, they seem to be completely in tune with themselves and the terrain—another demonstration that although surf and moto might seem vastly different, they are very much connected. It doesn’t matter whether you’re on a board in the water or on a bike in the sand; the essence of flow (membah, in Balinese), and the intimate connection with the landscape and Mother Nature, is virtually the same. The dust had settled on an epic day of riding, and as the golden light faded and the sun began to set over the caldera, we made our way back down the mountainside. We arrived back at the truck just before the dying light of dusk, and much like our early-morning trek up the hillside we were left loading up the bikes and equipment in the dark, under the light of the moon. I was worn out and dehydrated; my blistered hands and sunburnt neck were the trademarks of a day well spent. A few local children from a nearby hut curiously watched us take our helmets off, staring at us as if we were aliens from another planet. I guess that to them, that’s exactly what we were. As I peeled the layers of crusty gear off my salty skin, I sat there quietly in content, my dirty teeth smiling with the knowledge that this was an experience I will never forget. And although the day had come to a close, I found peace knowing that this journey was far from over and we would only be expanding farther outward in search of landscapes more isolated and alluring. The next morning welcomed a much-needed day of relaxation and recovery. As we sat around the pool cleansing our battered bodies and exchanging stories from the previous day’s adventure, Norris was packing his bags before heading to the airport later than evening. Unfortunately, real-world obligations summoned him back home to the Sunshine Coast. We were going to miss him, but our sights were set on the next destination and it was time to venture back out into the unknown, beyond the coastal boundaries of Bali. Our bikes were ferried across the ocean onto the larger, neighboring island of Java. Upon arrival, we quickly escaped the chaotic streets and traveled deep into the rural Indonesian countryside. After another four-hour drive, climbing almost 7,600 feet in elevation, we crested the top of the mountain well after dark, arriving in the quiet little village of Bromo. A breath of cold, crisp air was a refreshing change that felt like home as we stepped out of the car to stretch our legs and unload our luggage. We were quickly welcomed with a large plate of nasi goreng (Indonesian fried rice with chicken and a fried egg) served to us by an old lady in the neighboring house. As we sat around enjoying dinner, sipping on some Indonesian whiskey, Minchinton and the crew from Deus shared legendary tales of past trips to Bromo. The excitement was building for the final two days of this adventure and I went to bed early in anticipation of the morning ahead. Another 4 a.m. wakeup call came quickly as we geared up and rode out to the edge of the Tennger Massif—a large valley in the planet’s crust containing an active volcanic complex—to watch the sun rise. The stars began to fade as the sky turned a deep purple, revealing an endless, majestic landscape below. 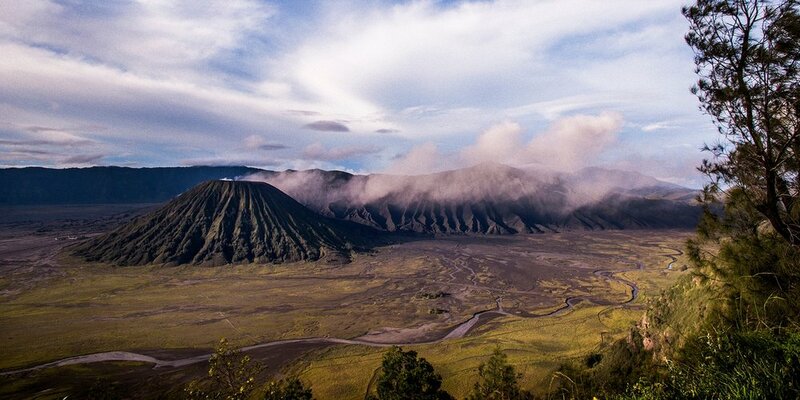 A vast and barren desert referred to as the Segara Wedi (Sea of Sands) surrounds the fire-breathing mouth of Mount Bromo, one of the region’s most active volcanoes. Mount Bromo billows ominous clouds of dark ash that ascend from the Earth’s core up into the atmosphere, composing a perplexing backdrop both haunting and beautiful. A group of locals on horseback pointed us in the right direction, and as the sun began to peek over the ridgeline and the thin layer of fog that covered the valley below began to fade, Minchinton and I made our way down the hillside to begin our exploration. The dream continued. As we entered the valley floor, the colossal landscape seemed to multiply in scale. We rode across the long, desolate stretch of sand that makes up the Segara Wedi and my eyes were in disbelief of the contrasting surroundings. Encompassed by a luscious green cliffside to our left, the billowing volcano of Mount Bromo to our right, and a lingering fog above us, these contradictory backdrops painted a unique panorama like nothing I’d experienced before. This endless, untamed landscape placed at our fingertips resonated as the single most awe-inspiring location a motorcycle ever has taken me (and probably ever will). Clouds of ash fell over a large expanse of dunes that encircle the base of Mount Bromo, and the beauty of this environment only increased as we began to see all the potential this terrain had to offer. 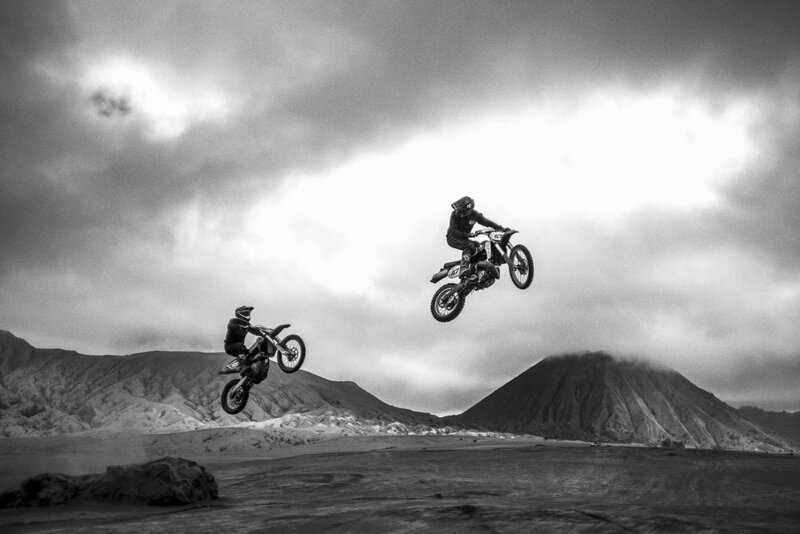 The fun began as these natural formations started to appear more like an endless array of perfectly formed jumps, berms, and trails. It’s crazy what the planet can offer your motorcycle when you open up your imagination to its possibilities. Minchinton and I followed each other for hours, back and forth across the caldera, testing ourselves on an array of natural obstacles. Launching off rocks, snaking through the dry riverbeds, and balancing our way up the steep and narrow ridgelines in the dunes, we were smiling from ear to ear. We took a break to discuss and contemplate a large jump connecting the gap between two massive dunes, and with a gulp of confidence Minchinton decided to go for it. I watched him fearlessly launch off the face of the jump, flying through the air with perfect form, and it appeared as if he was going to make it. I was wrong. He came up a few feet short and his tires sank into the soft landing, almost sending him over the bars, where he would likely land face first at the base 20 feet below. With Minchinton’s experience comes a level of composure, and luckily he was able to save it, completely unfazed. But with this near-catastrophe a heavy sense of reality sank into my gut. In the midst of a place so remote and massive, the risk associated with the smallest mistake multiplies significantly. 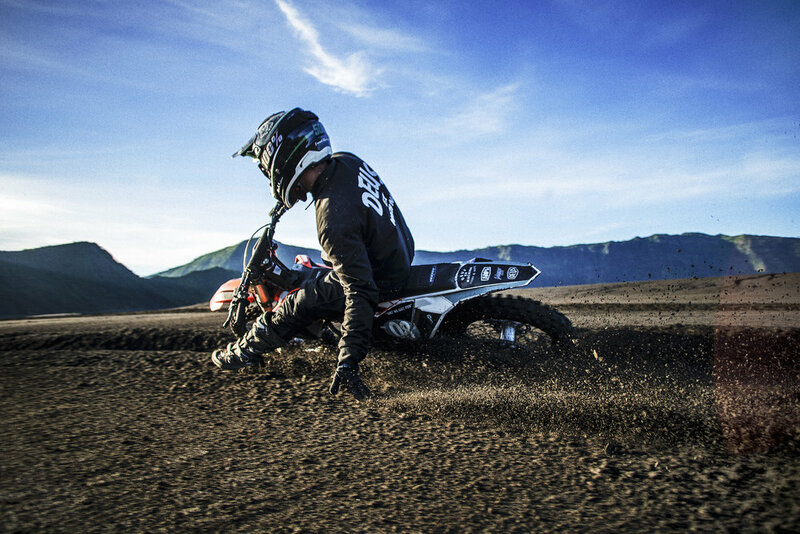 Mount Bromo is a magnificent sight for those lucky enough to behold it, but riding here will quickly put you in your place if your actions are anything less than perfect. Much like big-wave surfing, this is a landscape of heavy consequence that demands an immense level of respect.